This is a short appendix to my radiosity tutorial about using normal statements in combination with radiosity. 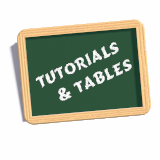 For general information you should have a look at the main tutorial. 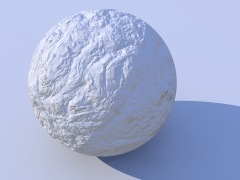 When using a normal statement in combination with radiosity lighting, you will see that the shadowed parts of the objects are totally smooth, no matter how strong the normals are made. to the radiosity block. This can slow things down quite a lot, but usually leads to more realistic results if normals are used. When using normals you should also remember that they are only faked irregularities and do not generate real geometric disturbances of the surface. 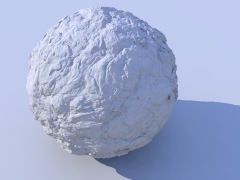 A more realistic approach is using an isosurface with a pigment function, but this usually leads to very slow renders, especially if radiosity is involved. You can see that the isosurface version does not have the unnatural smooth circumference and a more realistic shadowline.